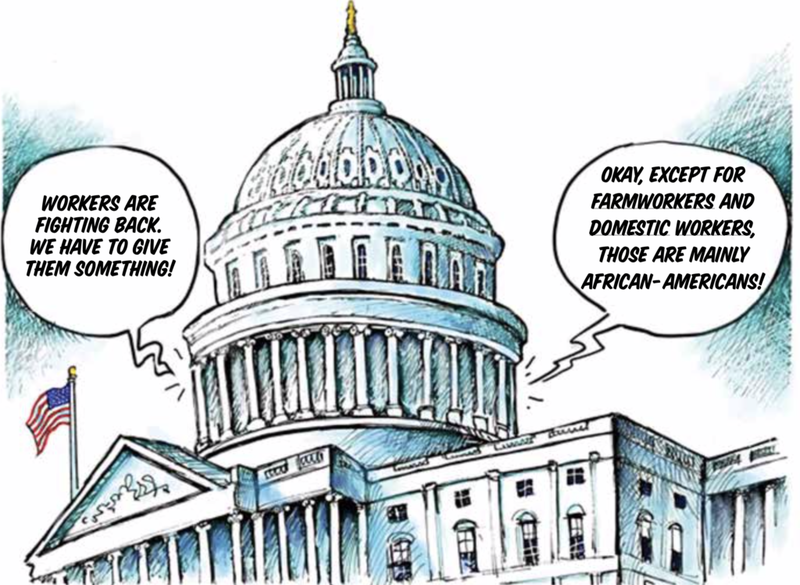 In 1938, Congress enacted the Fair Labor Standards Act which granted minimum wage and overtime protections to workers in the U.S. Southern lawmakers refused to pass the Act unless two key groups of workers were excluded: farmworkers and domestic workers. They did not want to open the door to equality for African-Americans who made up the majority of that workforce. Domestic work is rooted in the legacy of slavery, and today the vast majority of domestic workers are immigrant women of color whose work is socially and systemically undervalued. In 1976, California passed a Household Occupations Wage Order to provide minimum wage, overtime and other labor protections to domestic workers, but it still excluded workers who spent a significant amount of time caring for children, seniors and people with disabilities. By the early 2000s, the worker center movement had begun to grow, reaching primarily low-wage immigrant workers. Domestic worker centers also began forming throughout California and across the country and began coordinating with each other to share lessons. In 2000, Founding Bay Area organizations, Mujeres Unidas y Activas (MUA) and La Colectiva de Mujeres, joined with the Asian Law Caucus to analyze California State Laws related to domestic work in order to identify which laws domestic workers had been excluded from. MUA and La Colectiva then continued their investigative work in 2004 with the DataCenter and the San Francisco Department of Public Health, involving 30 leaders to create and conduct a participatory research project to better understand the working conditions of domestic workers. 240 surveys were collected, and the community research resulted in the first of its kind report about the conditions of California’s domestic workers. That year began a series of historic forums amongst domestic worker organizations: first in the Bay Area between MUA, La Colectiva de Mujeres, and People Organized to Win Employment Rights (POWER). Then in 2005, groups organized the first ever state-wide convening across Bay Area groups and Southern California domestic worker organizations, the Coalition for Humane Immigrant Rights of Los Angeles (CHIRLA), and the Pilipino Worker Center (PWC). For the first time, domestic workers at a statewide level prioritized their list of legislative demands and founded our statewide coalition, at that time called the Household Worker Rights Coalition. This early coalition launched the first California Bill of Rights campaign, called the “Household Worker Bill of Rights,” AB 2536, which passed through the Senate and the Assembly, but was vetoed by Governor Arnold Schwarzenegger. California organizations were in increasing conversations with domestic worker groups in New York and across the country, and in 2007, 12 domestic worker organizations convened at the US Social Forum in Atlanta, and The National Domestic Workers Alliance (NDWA) formed. An annual national domestic worker assembly has been organized every year since. In 2010, Hand in Hand: The Domestic Employers Network formed a local Bay Area, California chapter in order to organize employers in support of domestic worker rights, to win the multi-year Domestic Worker Bill of Rights Campaign, and to link their interconnected struggles for dignity in the home.